“US consumers who are not followers of Judaism or Islam are largely unaware of the specific qualities that distinguish kosher and halal from conventional foods. However, factors related to safety, quality and ‘truth in labeling’ should prompt these mainstream consumers to seek out kosher/halal more often, although marketers and third-party certifiers must make a greater effort to educate consumers before that can happen,” says Tatjana Meerman, Packaged Facts publisher. According to Meerman, the potential customer base for such products is large and includes the large segment of the American population who are concerned about the safety of the food supply, as well as the increasing number of people on gluten-free, dairy-free, vegetarian or other special diets who want clearer food labelling. I've been in a (financial) recession most of my life: keeping kosher is not that pricey if you eat and shop right to begin with. Buy (or grow if possible) fresh organic veggies and fruit. Eat less meat (but kosher and organic( if available) Avoid prepared and junk food at all times. Eat less! look around you: we are becoming a nation of cows! At lunch at work my kosher chicken, steamed broccoli and brown rice costs about 3 dollars (from home) my younger colleges fast food junk meals average 6 dollars! These are items that have some sort of "hechsher". The sales don't represent that people are buying these products because they are kosher. But trust me, the OU, OK, Kof K. etc. are use these numbers when they go on a sales call to some unwitting food manufacturer in the mid-west. 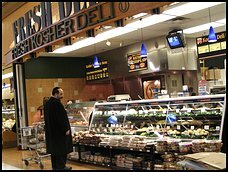 $200 billion a year in US kosher food sales? Let's be generous and say that 2 million people in the US keep kosher(the true number is probably closer to one million) . That works out to $100,000 a year in food sales per person who keeps kosher. :) Obviously many people who aren't Jewish are also eating these foods. In the NYC metro area for example, a very large percentage of vegetarian or dairy products that supermarkets sell are certified as being kosher. So everyone who buys a can of Coke whatever the reason, be they a Jew or not, is contributing to this figure. How many actually buy BECAUSE it is kosher? Broccoli? What about the bugs? Guess they're free. It would seem that the $50 billion increase over 6 years is primarily due to the precipitous increase in kosher food prices (particularly meat) and not a significant increase in volume. I'm in the kosher food business. I assure you this figure includes oreo, coke, hellmans, poland spring water, dasani, aqua fina, entermans, heinz, you get the picture. Its a broad and uneducated figure. Almost like saying moms local grocery store combined with walmart grew 30 billlion in sales. I would say the traditional kosher brands dont even represent 1% of that number. I can hardly wait for the inevitable anti-semitic news story that will claim Jews are the source of the economic downturn due to profiteering in the kosher food market. Are you nuts? Many kosher brands have added the Halal certification as well in order to appeal to more people. Secondly, and you may not know this due to your ignorance, MANY Muslims eat kosher meats and help keep our prices LOWER. I work with a wonderful religious Muslim man. We frequently eat together as we both bring our lunches to work. He buys mostly kosher meat in his home as Halal is too hard to come by in our area. They believe that shechita is in accordance with their own rules, and that if Halal meats is not available, kosher meat is also acceptable. They also prefer to buy kosher cheese so that it does not include an animal product from an improperly slaughtered animal. They accept all reliable hashgochos for cheese... it was funny to hear him talk about having trouble finding Haolam cheese a few weeks ago! Don't be so quick to judge. Not every Muslim is a terrorist. They are purchasing OUR products. They help keep demand high so that we can all keep prices DOWN. It is such a shame that American Muslims and American Jews have so much in common.... so much that they COULD cooperate on in order to lower prices and improve availability and DON'T because the minority of wackos on BOTH sides are such hateful, prejudiced, filth.